Something Good Radio Episode Reminder Get a sneak-peek into each new show, delivered straight to your inbox! In The Message, Romans 8:28 says, “Every detail in our lives of love for God is worked into something good.” Something Good Radio is a daily radio outreach that features the Bible teaching ministry of Dr. Ron Jones, lead pastor of Atlantic Shores Baptist Church in Virginia Beach, Virginia. Something Good Radio exists to share the love of Jesus Christ through life-changing Bible teaching and to strengthen the local church. 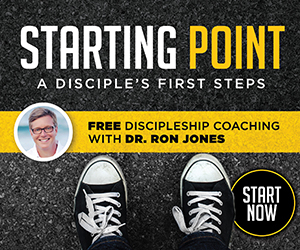 Ron Jones is a pastor, author, and radio Bible teacher. For more than two decades, he has devoted his life to leading and preaching in the local church. He currently serves as lead pastor of Atlantic Shores Baptist Church in Virginia Beach, Virginia, where he delivers his Bible teaching for everyday life. Ron’s listening audience extends beyond the local church he serves through a daily radio broadcast called Something Good with Dr. Ron Jones. Something Good Radio exists to share the love of Jesus Christ through life-changing Bible teaching. A lifelong learner, Dr. Jones earned degrees from Purdue University, Dallas Theological Seminary, and The Southern Baptist Theological Seminary. He is the author of Mysteries of the Afterlife: Exploring Its Amazing Secrets (Harvest House Publishers, Eugene, OR). Ron lives five minutes from the beach with his wife Cathryn. They have two children in college who are also NCAA athletes.